Background SDSS image (composite from bands g, r and i) overlaid with white MSSS contours of the GRG at 2, 3, 4, 6 and 8 times the RMS noise (34 mJy/beam). NVSS contours are overlaid in red at 3, 5, 10 and 20 times the RMS noise (0.55 mJy/beam) revealing a bright part of the radio jet towards the north-east. The beam sizes are shown in the lower left. Credit: Clarke et al., 2017. (Phys.org)—An international team of astronomers reports the discovery of a new giant radio galaxy (GRG) associated with the galaxy triplet known as UGC 9555. The newly discovered galaxy turns out to be one of the largest GRGs so far detected. The findings were presented Feb. 6 in a paper published online on arXiv.org. Located some 820 million light years away from the Earth, UGC 9555 is a part of a larger group of galaxies designated MSPM 02158. Recently, a team of researchers led by Alex Clarke of the Jodrell Bank Centre for Astrophysics in Manchester, U.K., has combed through the data provided by the Low Frequency Array (LOFAR) and uncovered new, important information about this distant disturbed galaxy group. The team has analyzed the data available in the LOFAR Multifrequency Snapshot Sky Survey (MSSS). It is the first northern-sky LOFAR imaging survey that covers the sky north of the celestial equator at frequencies from 119 to 158 MHz in eight separate 2.0 MHz bands. The images obtained as a part of the LOFAR MSSS allowed the scientists to distinguish a new giant radio galaxy. 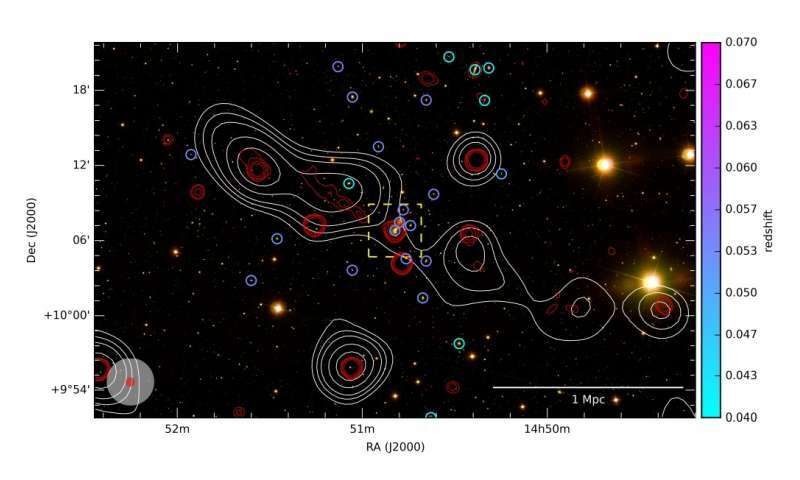 "We report on the discovery in the LOFAR Multifrequency Snapshot Sky Survey (MSSS) of a giant radio galaxy (GRG) with a projected size of about 2.56 Mpc projected on the sky," the researchers wrote in the paper. GRG are radio galaxies with an overall projected linear length exceeding 6.5 million light years. They are rare objects grown in low-density environments. GRGs are important for astronomers to study the formation and the evolution of radio sources. The newly detected GRG which has not received any official designation yet has a projected linear size of 8.34 million light years. This makes it one of the largest GRGs known to date. Currently, with a projected size of approximately 16 million light years, the J1420-0545 holds the title of the largest giant radio galaxy discovered so far. The team noted that the newly detected GRG has integrated flux density at 142 MHz of 1.54 Jy over the whole dual-lobe emission, including underlying background point sources, which gives a total luminosity at 142 MHz of 11.6 septillion W/Hz. However, the available LOFAR MSSS and archival radio data are still insufficient to confirm the class of this GRG. Radio sources are divided into two classes: Fanaroff and Riley Class I (FRI), and Class II (FRII). "We cannot clearly classify this GRG as an FR-I or FR-II source based on its morphology in the MSSS and archival radio data. There are no conclusive enhancements of emission from the resolution of the MSSS data (without the contribution from unassociated point sources) from which to use the standard Fanaroff-Riley classification," the paper reads. The researchers concluded that the luminosity suggests it is a borderline case between FRI and FR-II, although the large size and therefore old age contributes to a decreased luminosity. They hope that further data gathered from a deep LOFAR observation will clearly classify the properties of this GRG. We report on the discovery in the LOFAR Multifrequency Snapshot Sky Survey (MSSS) of a giant radio galaxy (GRG) with a projected size of 2.56±0.07 Mpc projected on the sky. It is associated with the galaxy triplet UGC 9555, within which one is identified as a broad-line galaxy in the Sloan Digital Sky Survey (SDSS) at a redshift of 0.05453±1×10−5, and with a velocity dispersion of 215.86±6.34 km/s. From archival radio observations we see that this galaxy hosts a compact flat-spectrum radio source, and we conclude that it is the active galactic nucleus (AGN) responsible for generating the radio lobes. The radio luminosity distribution of the jets, and the broad-line classification of the host AGN, indicate this GRG is orientated well out of the plane of the sky, making its physical size one of the largest known for any GRG. Analysis of the infrared data suggests that the host is a lenticular type galaxy with a large stellar mass (log M/M⊙=11.56±0.12), and a moderate star formation rate (1.2±0.3 M⊙/year). Spatially smoothing the SDSS images shows the system around UGC 9555 to be significantly disturbed, with a prominent extension to the south-east. Overall, the evidence suggests this host galaxy has undergone one or more recent moderate merger events and is also experiencing tidal interactions with surrounding galaxies, which have caused the star formation and provided the supply of gas to trigger and fuel the Mpc-scale radio lobes.